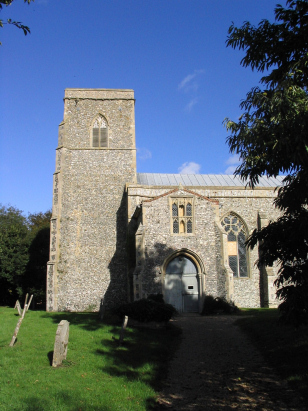 The parish of Hevingham sits in north-eastern Norfolk, alongside the main A140 road linking Norwich with the north coast at Cromer. The village is roughly 4 miles south of the market town of Aylsham. The area is full of heathland with poor agricultural quality, a glance at the occupations of the fathers in this transcript reveals the local industry of broom making from the broom and sedges of the heath. Today the village has grown to a substantial settlement mostly to the west of the busy A140. 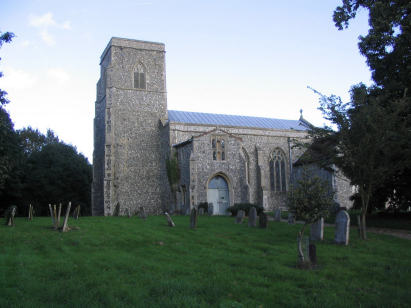 St Botolph's church lies to the north of the village, almost a mile north of the current settlement and adjacent to the A140. The church is largely 14th century and in the Decorated style, however a late Victorian make-over has masked many of the original features. The hammerbeam roof inside is rather spectacular with carved angels and a lofty feel. The transcript period is covered by three standard 800-entry register books. The first 2 are filmed on Microfiche 6 through to 9, the third book being completed on fiche 17. These microfiche are very early filming for the NRO and are not of the quality achieved today. The fiche are faded and in places reference to the Bishop's Transcripts had to be made to clarify an entry. On the whole the handwriting was of a reasonable standard but the quality of the fiche is such as to raise a caveat against possible misreading. It is hoped that few errors have crept in but this is not ruled out on this occasion.